There are many frightening things in the depths of the jungle, but the shrine of Big Kahuna is the most terrifying. Click here to play! Holding a mask that was molded in the fires of a volcano, the shrine of Big Kahuna has claimed the life of many a jungle explorer and drunken traveler over the years. It is said that the shrine of Big Kahuna holds fabulous treasures, enough to live in luxury for a thousands lifetimes, but few have gotten near the shrine without injury, let alone come back from it. It is protected by many dangers: Gila monsters, the priests of Big Kahuna, insanely protective monkeys, and the fires of the volcano that holds the shrine. A brave explorer such as yourself may be able to make it to the shrine and return with the fortunes of Big Kahuna. If you can return with the Seal of Big Kahuna, then you will receive riches beyond your wildest imaginings, as relic collectors have been trying to retrieve it for centuries. Only the luckiest of explorers could be successful in this quest, but I have a good feeling about you. You must hurry though! The time is right to set out for the shrine of Big Kahuna. If you delay, Big Kahuna's treasures may be lost to you forever! Crazy Monkey symbols have a scatter payout, paying out on the total bet. Big Kahuna Seal symbols are wild, substituting for fruit symbols only. 3 or more Volcano symbols left to right on a payline trigger the volcano bonus game. In it, players select a fruit offering to the volcano. This will have a prize value attached to it. 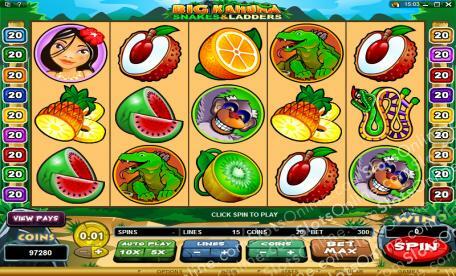 3 or more Big Kahuna Mask symbols left to right on a payline trigger a slightly different game. In it, players choose masks, winning the revealed value, until the revealed value reads 'collect'.